How can you gently and carefully weigh bedridden patients or those who are unsteady on their feet? The best choice is a seca chair scale, which you can take directly to the patient. That saves you – and the nursing staff – from unnecessary steps. SKU: seca954. Categories: Medical, Seca. The comfortable seat provides a safe position while the swiveling armrests and adjustable footrests make the chair scale more user friendly. 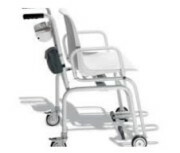 The locking rear wheels ensure that it is safe to sit down and stand up at all times. The positioning of the large LCD display unit behind the chair permits intuitive operation of functions TARE, HOLD and BMI. At the press of a button, the seca 360° wireless technology transmits measurements to a seca wireless printer or a PC. This mobile chair scale, which can be operated by a rechargeable battery provides enormous help in rehab, orthopedics, dialysis, nursing homes and pediatrics.